There’s something special about meeting someone nice for the first time. If that spark is in the air, you want to know everything about the other person. By the end of the evening you know all sorts of things about the new someone. Those stories become the foundation for a new, wonderful, relationship. That sharing of stories didn’t happen between my mother and me until I was over forty years old. So many things seemed more important for those first forty years. I needed my allowance a day early, or it was time to get a driver’s license, or my own life filled my brain. Then I met Judy and stories about the past no longer mattered. Stories about Judy became my goal. Since Grace died twenty years ago we’ve visited the Kunkel farm where she grew up a couple of times, and I’ve often visited the Fairview Cemetery where she’s buried. In the summer of 2015 the extended family gathered at the Luehr plots in Fairview to bury Grace’s older sister. The wind blew off our hats, and swept our words onto the wheat fields. Grace and her parents experienced that same wind, on those same hills in the first half of the twentieth century. As much as the climate was similar, just about everything else was different. The story I’m enclosing was told to my sister-in-law Elaine. 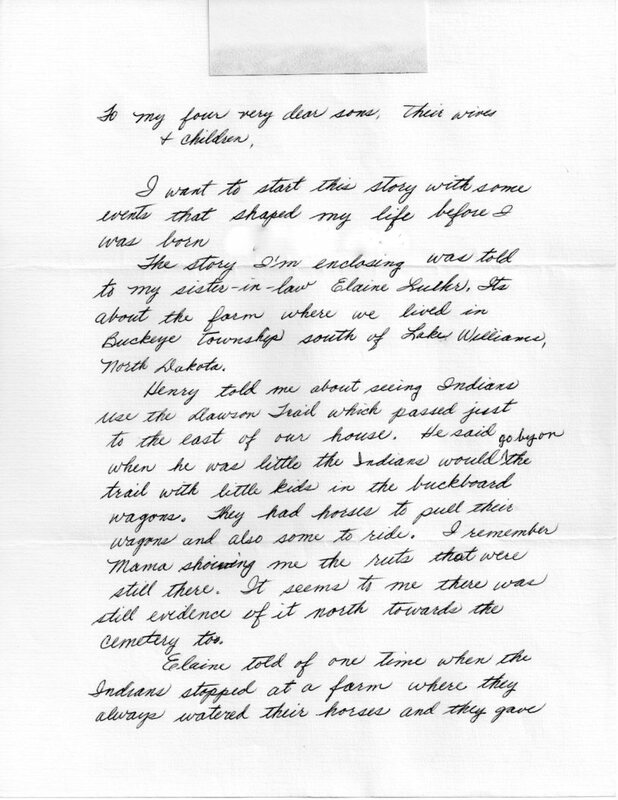 It’s about the farm where we lived in Buckeye township south of Lake Williams, North Dakota. Henry told me about seeing Indians use the Dawson Trail which passed just to the east of our house. He said when he was little the Indians would go by on the trail with little kids in the buckboard wagons. They had horses to pull their wagons and also some to ride. I remember Mama showing me the ruts that were still there. It seems to me there was still evidence of it north towards the cemetery, too. Elaine told of one time when the Indians stopped at a farm where they always watered their horses and the gave the farmers a pony as a gift. She said there used to be remains of several sod houses from the homesteads but they have all been farmed over now. Our farm or section of land was not a homestead because it had been given by the state to the railroad. The railroad was built farther north so they sold the land to Kunkle who built the house. There is speculation that he may have built it for a stagecoach stop as each of the four bedrooms upstairs had a chimney for a stove and in the center of the house was an opening to the attic with a door directly above in the roof so you could go out on top of the house. It’s possible to see for many miles and would be perfect for watching for stagecoaches and Indians. I loved going up there myself to look around the country and daydream. 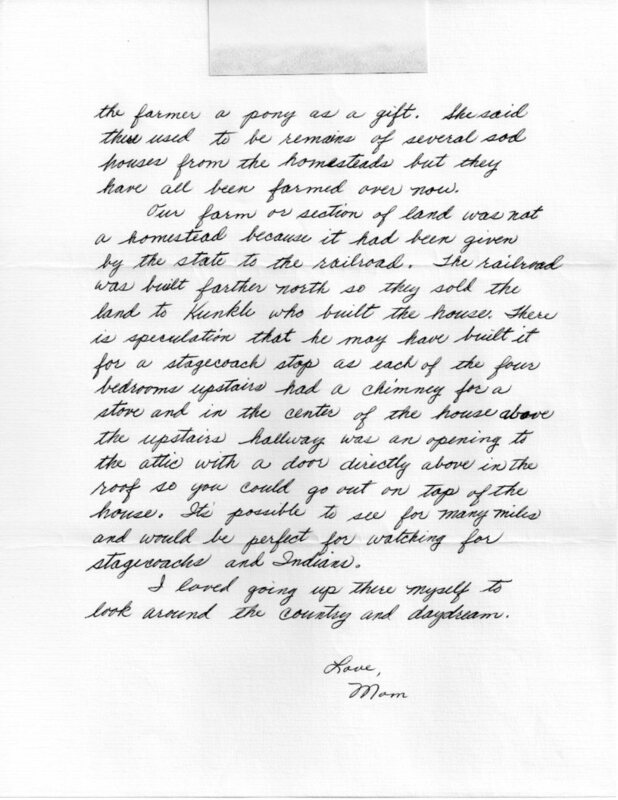 One more comment before you see the letter: Grace describes the “Widow’s Walk” on the roof of the Kunkle house. Grace’s mother once told us that when she was due to give birth to one of her children, Grandpa Ted instructed her to climb up to the attic, get out on the roof and hang a blanket so that he’d see to come back and help. 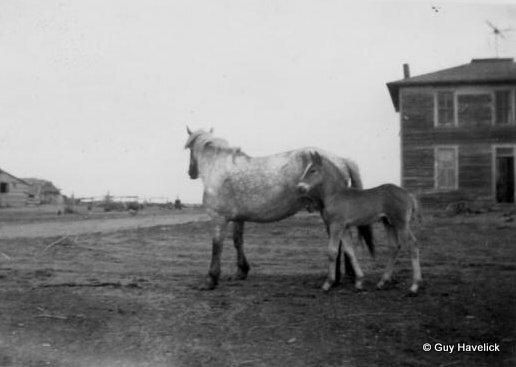 This entry was posted in Grace's Letters and tagged 1931, Kidder County ND, Kunkel farm, Lake Williams ND, Railroad, Revised. Bookmark the permalink.